See T105924: Graph extension should exclude scripts tags so they will not be parsed by TextExtracts. rETEXda9f4fe1e72c: SECURITY: Disallow extracts for non-wikitext for now. rETEX4c6e6c77e6ae: SECURITY: Disallow extracts for non-wikitext for now. rETEX9e524959ff04: SECURITY: Disallow extracts for non-wikitext for now. rETEXf5c114c571e0: SECURITY: Disallow extracts for non-wikitext for now. rETEX63b358fca264: SECURITY: Disallow extracts for non-wikitext for now. Catrope changed Security from None to Software security bug. • Mattflaschen-WMF edited projects, added TextExtracts; removed Security, Page-Previews. • Mattflaschen-WMF added subscribers: Mooeypoo, Catrope. This is a temporary fix to strip tokens. After this is deployed, we'll discuss publicly. Ideas include mw.config and addInlineScript. The first part is deployed. Now I'm figuring out what to do about cache invalidation. I don't think it's in parser cache (isParserCacheSupported), because that's opt in and we didn't opt in. I'm not sure about Varnish, but it definitely is in memcached. We'll use it once now to evict the tokens, and again later, since I think the rest of the data is problematic from a moderation standpoint. Would it be easier to make TextExtracts refuse to give extracts for non-wikitext content model pages? api.php doesn't send caching headers by default, unless you opt into them using a query parameter and tell it the caching timeout you want. I guess action=jsonschema overrides this behavior somehow, which is a relatively rare thing for API modules to do. That's a good suggestion. It should be sufficient until we do T107200: Good Flow experience with HoverCards and TextExtracts. Even then, we would only need to run the eviction if the cache key didn't change. I'll do this as a whitelist just in case there are some other content models that it should support. I don't think the warning is necessary and will end up being confusing if extracts are requested for multiple pages (https://en.wikipedia.org/w/api.php?action=query&titles=Main%20Page|Wikipedia|Wikimedia&prop=extracts&exchars=40&exlimit=10&exintro=1). I'd still add a warning: giving no extract even though it was requested would also be confusing. But maybe the warning should be more clear about what page it's returning an empty extract for. LGTM otherwise. Updated to specify which page is affected. It works if multiple pages are requested and some are supported and some are not. The warning shows up once for each non-supported page. This is not needed now. It will only be needed later if we start enabling flow-board with the same cache key. b. Get propagated properly to the 1.26wmf17. You should now see output like https://en.wikipedia.org/w/api.php?action=query&prop=extracts&exchars=300&titles=Wikipedia%20talk:Flow/Developer%20test%20page&format=jsonfm&callback=foo or https://www.mediawiki.org/w/api.php?action=query&prop=extracts&exchars=300&exintro=true&titles=Talk:Sandbox|User%20talk:Mattflaschen&format=jsonfm&callback=foo&exlimit=2 regardless of whether it's in cache. 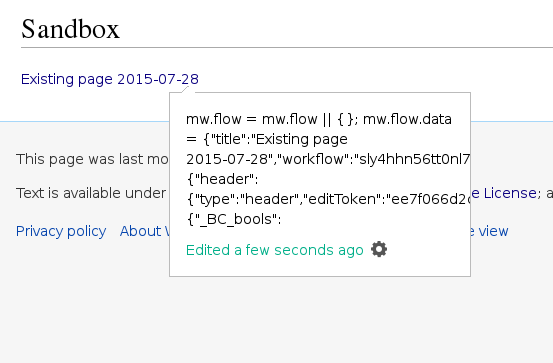 "Wikipedia_talk:Flow/Developer_test_page has content model 'flow-board', which is not supported; returning an empty extract." then either an empty extract or "..." depending on TextExtracts mode. The patch should be up on tin in /srv/patches/extensions/TextExtracts (and Flow). So they'll automatically get applied to wmf17 if that branch cut happens before the patches are merged into master. It looks like there are a few non-WMF wikis using it, and it's listed on mw.o as "stable". @demon / @MaxSem, do you have a preference if we just push the patch to master vs making this part of the next release? Why write smart invalidation scripts in the first place when you can just update the TE cache key schema? Cache hit rate isn't that high anyway. Next MediaWiki release (where we'll also release OAuth patches, and patches for any bundled extensions). We did discuss doing that (I realize it can only cache latest version anyway), but decided not to bust the cache. It's a moot point, though, since we decided to use @Legoktm's approach instead (just not returning anything for non-wikitext). The eviction script has not been run in production, nor are we planning on doing so anytime soon. We still need to decide whether to merge to master now (both (Flow, TextExtracts) patches, one, or neither). @demon says JFDI. @csteipp, @MaxSem? But needs an announcement afterwards. Plus one meaning you support merging both right now? JFDI, for merging both into master now. Should I send the announcement? To MediaWiki-l? @csteipp said wikitech-l is fine. We just need to decide whether to merge before or after the branch cut. • Mattflaschen-WMF mentioned this in rEFLW1fa6a191b03b: SECURITY: Strip edit tokens in mw.flow.data. SECURITY: Disallow extracts for non-wikitext for now. • Mattflaschen-WMF mentioned this in rMEXT0036fa674867: Updated mediawiki/extensions Project: mediawiki/extensions/TextExtracts…. • Mattflaschen-WMF mentioned this in rEFLW106763badb5c: SECURITY: Strip edit tokens in mw.flow.data. • Mattflaschen-WMF mentioned this in rETEXf5c114c571e0: SECURITY: Disallow extracts for non-wikitext for now..
Can someone take a look at the backports? They're failing because of some package.json problem. I'm not sure if it's a known CI issue and if I should force it. • Mattflaschen-WMF mentioned this in rMEXT2717821235a5: Updated mediawiki/extensions Project: mediawiki/extensions/TextExtracts…. • Mattflaschen-WMF mentioned this in rETEXda9f4fe1e72c: SECURITY: Disallow extracts for non-wikitext for now..
DannyH removed a project: Collaboration-Team-Archive-2015-2016.